There is no shortage of fun to be had in Atlanta. The city is filled with plenty of big-name attractions, including the Georgia Aquarium, World of Coca-Cola and the National College Football Hall of Fame. Even so, there are plenty of other ways to experience Atlanta's culture without breaking the bank. Here are 20 ideas for free things to do in Atlanta. And If you're looking for even more ways to save, check out some affordable attractions in metro Atlanta, as well as tips for saving money at the Georgia Aquarium, Zoo Atlanta and the World of Coca-Cola. Whether you’re soaking in the summer heat or celebrating the fall breeze, Piedmont Park is one of Atlanta’s best destinations to enjoy time outdoors. With tennis courts, a swimming pool, a dog park and more, there is something for everyone in the family to enjoy while getting picturesque views of Atlanta’s famous skyline. Step back into 1996 and take a stroll through downtown Atlanta’s Centennial Olympic Park, after visiting classic area attractions, such as the Georgia Aquarium or the World of Coca-Cola, or eating a meal at one of the delicious nearby restaurants. Let your kids play around in the Fountain of Rings and enjoy the many different seasonal attractions that the park offers, like Music at Noon concert series in the summer and ice skating in the winter. Spend an afternoon with some of Atlanta’s most notable citizens. The​ ​Historic Oakland Cemetery is the final resting place of Bobby Jones, Margaret Mitchell, Maynard Jackson and other settlers of the city. 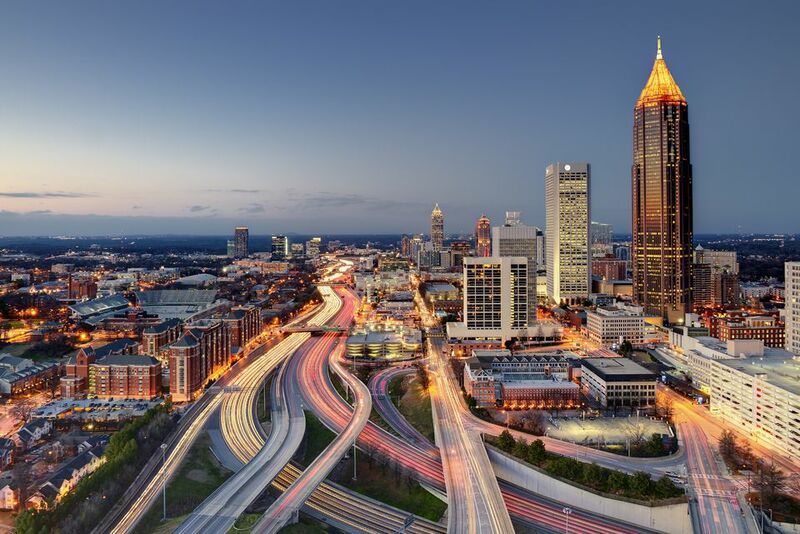 Take in the exceptional architecture, greenery, and views of Atlanta’s skyline, while discovering Atlanta’s history from the very beginning. Take a step back in time and celebrate the legacy that Martin Luther King Jr. has left upon our country. You can visit his birth home and the Historic Ebenezer Baptist Church, where King was co-pastor with his father. While you’re there, take the time to learn more about his passion for social justice at The King Center, while visiting King’s final resting place. Then celebrate his fight for peace at the “I Have a Dream” World Peace Rose Garden. Photo courtesy of Advanced Systems, Inc.
Take time out of your busy schedule to tour the Georgia Governor’s Mansion. The tour is self-guided, but there are volunteers throughout the house who are ready to discuss the history of each room with stories from many different governors. Visit during the holidays to experience the Governor’s Mansion dressed up in its best holiday decorations. Enjoy the great outdoors while exploring Atlanta along 22 miles of unused railroad tracks throughout the city’s most popular neighborhoods. Rent a bike, bring your dog and grab a bite to eat at one of the many restaurants along the trail (although that's not technically free). Pack a picnic if you are on a budget. Be sure your kids bring their skateboards and hang out at the Historic Fourth Ward Skate Park. For the artist in the family, enjoy the outdoor displays that are part of the ​Art on the Atlanta BeltLine exhibit. The Fernbank Science Center is a museum and woodland center operated by the DeKalb County School System that encourages the understanding of science and technology and how it works in agreement with nature. The center has dinosaur skeletons, live animals and an authentic Apollo spacecraft for you to see when you visit. Admission is completely free to the center, and most of the seasonal exhibits and activities have no extra costs to enjoy. Visiting the planetarium will cost you some money, but the extra cost is worth the fun. As the unofficial hippie haven in Atlanta, Little Five Points is the place to explore hipster-approved vintage stores, listen to the metro-wide indie station, WRFG Radio, located in the district and take pictures with the vast array of street art filling the community. Walk around with your perfectly brewed espresso drink from Aurora Coffee and people-watch as you enjoy this quirky, artsy community unique to the city of Atlanta. Learn more about the rich history of our city while you wander through Atlanta’s old transportation hub. Castleberry Hill is defined by its past, as it is listed on the National Register of Historic Places. On the second Friday of each month, the community hosts the free Second Friday Art Stroll, where local galleries have their art on display for visitors to browse and enjoy. Atlanta boasts an almost overwhelming number of festivals to fill your weekends, and the majority of them are free, family-friendly and packed with different activities, artists, and cultures that call Atlanta home. What was once a secret amongst the keenest Atlantans, Jackson Street Bridge is the undeniable location in Atlanta with the best view of the downtown skyline. Make the bridge a part of your morning run or take a break from shopping and enjoy the buzz of the city. Whether you bring a professional camera to test out different lighting techniques or your iPhone on a selfie stick, the view is unmatchable on any lens. Although tickets to Stone Mountain Park ​are on the pricey side, the park’s infamous laser show is entirely free. Cram your family and friends into the largest car you’ve got and split the $15 parking fee. The fun you’ll have is worth every penny. Pack a picnic and enjoy your dinner on the giant lawn during the show. Remember to bring a football or Frisbee to throw around beforehand while you enjoy the beautiful Georgia spring, summer or fall. Need a brush-up lesson in civics? Spend a day taking a free tour of the Georgia State Capitol. During the 20 to 40-minute tour, you will be introduced to the importance of democracy in the Georgia state government. Your tour guide will teach you ​the history ​of past Georgia capitals, along with sharing interesting features of the capitol building, historic Georgia figureheads and more. On the second Tuesday of every month, bring your kids and their friends along for an exciting, interactive day at the Children’s Museum of Atlanta. Sponsored by Target, the museum welcomes those who might not be able to pay the usual admission costs or those who want to see what it’s all about first. Pack some lunches before you go and enjoy the many programs the museum puts on throughout the year. Whether you visit during your lunch break or stop by while waiting for traffic to die down, visit Savannah College of Art and Design Atlanta campus’ art gallery to view the work of different artists. The exhibitions vary throughout the year, from photographers to graphic artists and musicians. Visit the website to stay up to date on the different exhibitions. The gallery is always free to visit and open to the public. Promise yourself that you’ll only window shop and enjoy some of Atlanta’s best outdoor shopping for free entertainment at Atlantic Station. During the summer months, take a break from perusing the many different stores in the area and sit on the lawn in Central Park for free showings of classic and modern movies. Make sure to check the lineup to stay up to date on the special events that will take place before some of the movies and the special savings on to-go offers from restaurants in Atlantic Station. With 600 photographs and more than 8,000 words, the Anne Frank Exhibit in Sandy Springs pays homage to Frank and her family, from their time in hiding while living in Amsterdam to their death in the Bergen-Belson concentration camp. The museum is a great way to introduce your children to the history and lessons of the Holocaust while appreciating the infamously strong story of Anne Frank. It’s so memorable, you won’t believe it cost you nothing to see. Take a trip to Emory University to inspire your high school senior to skip the “senioritis” or to take a trip down memory lane of your own college experience. Walk around the picturesque campus before you attend a free lecture, musical performance or arts show. Check our Emory’s event calendar to see what’s on the docket on your next day off. Living Walls Atlanta aims to change perspectives of Atlanta’s many public spaces through redefining street art. Located throughout the city, the works of art will make you stop to appreciate the innate beauty of art outside of the walls of Atlanta’s many museums. Visit the wall created by Caroline Caldwell at the corner of Edgewood Avenue and Hillard Street or the wall at 320 E. Howard Ave. in Decatur by Jason Kofke. While searching for these walls, you’ll discover new parts of the city. Spend a warm day this spring or summer floating down Atlanta’s legendary Chattahoochee River. You can rent a canoe, kayak, raft or stand-up paddleboard to enjoy your float, but no matter which ride you choose, you’ll get to experience the scenic greenery that runs straight through the middle of Atlanta. Note: If you don’t bring your own equipment, there is a small rental fee.